Our world is full of beautiful and colorful sights created by nature. On the one hand there are high mountains while on the other hand there is roaring ocean and in the mid there are streams and waterfalls singing beautiful melodies. In the other words animals, birds, rainbow, botanical and marine life and most important of all of these human beings are a beautiful contrast of nature’s creativity. The beauty of nature on its place, human beings have also added many beautiful buildings to this landscape. This process had started thousands of years ago and is still going on. Many tourists are visiting these buildings to see the masterpieces of these architects, see, and feel the revolution of architect. So that they can understand how our ancestors used to live thousands of years ago. Historians take architects as artists and their unique creations as masterpieces of art. These artists have been constructing the buildings according to their natural way of living, climate, and economical situation. Some of these buildings have been able to survive the wear and tear of time, earthquakes, and storms. One of these masterpieces is the building of MGM (Multan Garrison Mess). It is a masterpiece of architect and example of its own. This building consisting of 13 domes of different sizes was constructed in 1880. The sad aspect is that no research has been done on this building constructed by the clay (Gachee Mitti) of Chenab River. No such struggle has been done on the govt. level. Just because this building is situated in Multan, like Multan the history of this building of 13 domes is also silent. There is nothing saved in the paper, whatever is known has been transferred from heart to heart/folk. This is also a truth that except few buildings of Turkey whose walls consists of 9 or 11 domes there is no other building having so many numbers of domes of different sizes but geometrically same. 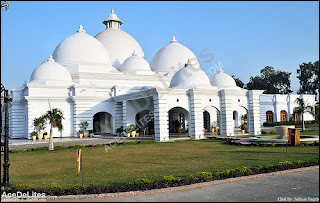 The international passengers travelling through airplanes also get interested into this moon of 13 domes dazzling in the dark, but they have no knowledge about this building except the dirt, heat, beggars and graveyards of Multan. Before writing anything about the building I would like to briefly disucss the history of construction of domes. Although historically many things are different from in these styles of architecture from each other, but few features are mutual as well, one of them is dome. As today’s topic is building of MGM, the unique thing in it is are its domes so we will be discussing only domes. Thousands of years the inhabitants of Egypt believed that after death the souls keep hovering in the air/space as there is no facility for their stay. Keeping this hypothesis in mind the construction of dome started in Egypt. This dome was like the shape of an egg. In order to construct this dome, the woods of same angle, or young stems of trees were fixed into the ground in circles and were joined together in the upper end. These lumbers were covered with straws and plastered with clay, this formed the shape of an ugly dome after it got dried. This dome like room was specified for the people who were about to die and their relatives. After the death, the body was disposed off as per custom. But according to the belief it was imagined that the dead is living within the dome. One dome was believed to be sufficient for other soul of the died people in the family. According to the historians this dome was known as Abode. Gradually Egyptians started making bricks from the clay of Nile River and after drying them up the construction of four walled room started. So the construction of dome also got much developed. In spite of straight roofs over the rooms the domes made of wood were being constructed. Till this time human being were not aware of the skill to build arch. Romans first of all got aware of arch building art. Romans used stones for construction, first of all stones were fixed over one another and the walls were constructed, afterwards the roof was built by the wooden boards. For the elites of Romans, collective warm baths were constructed. These baths of warm water were only used by king or his relatives. The steam from the warm water was not convenient for the bathers so the research for construction of dome started. Although the dome was built of stones but in order to support them timber was used. In the high end of the dome a small hole was left so that steam can find its way out. The art of building the dome through arch, putting bricks step by step was developed by the Mesopotamians (Arabs) living in present Iraq, Syria and Lebanon, who were religious less till than. 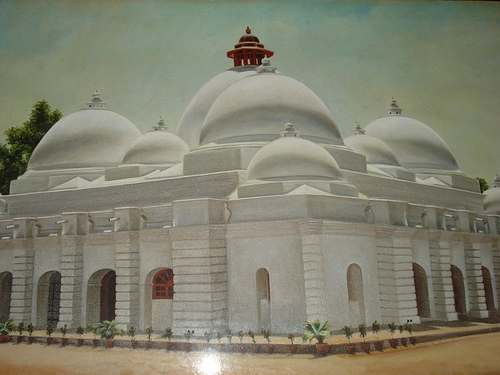 These domes of 10 feet diameter were constructed only over the worship places, perhaps this is why dome and Masjid became necessary for each other. In following them Romans decided to show off their skills and built a dome of 100 feet which was constructed over the building of a temple. This was named as Pantheon i.e. Temple of All Gods. The whole century was spent in its construction, completed 124 years after the birth of Respected Eessa (Christ). After 300 years of Christ’s birth Byzantine architecture started, which spread like perfume due to its beauty and beautiful carvings, dome had a pivotal role in these buildings. Domes were made beautiful by carvings and gold work. The masterpiece of Byzantine architect, the museum of Hajiya Sufiya is still present in the Istanbul. This was constructed in 532 as a church, but afterwards when Byzantines accepted Islam they changed it into Masjid. Afterwards due to dispute between two religions it was converted into a museum. In this building on the single roof, there are nine domes. Keeping in mind this marvelous building Byzantine architecture got popular in Italy, Greek and in Balkan states. From here, this art arrived into subcontinent with the addition of carvings and tiles from Russia, Samarkand, Bukhara, Afghanistan, and Iran. If we say that dome got a central role in Islam and became symbol of Islam than this will not be wrong. Although there are domes of 120 feet diameter over the famous church of St. Peters in Rome, but dome became symbol of Islam. After watching the Masjid in Istanbul by Sultan Ahmad which has 11 domes, famous architectural historian Sir Christopher Wren had said, “this is only and unique masterpiece of Islamic architecture, all other buildings are inferior in front of it”. Lets come back towards MGM, the resident specified by English used to stay in lahore who was known as Punjab State Resident. Bahawalpur State had developed friendly relations with English. In order to further these relations English resident allotted 7.63 acres to Nawab Bahawalpur, where MGM is situated now. According to the stories told by elders Nawab Bahawalpur who was of Turk accent, constructed a building on this place on Turkish architecture by making clay bricks from Chenab river. Who was the architect and engineer of this building, the names of artisans, it is unknown. But it is known that at the time of construction no Damp Proof was used in the foundations of the building. The reason behind this is that at that time the ground water level of Multan was low, so walls were safe from damping. So there was no concept of damp proof at that time. According to elders when English specified boundaries of Multan cantonment the area between old Bahawalpur road, Kalma Chowk to Chowk Sadu Hasam was included into Cantonment. On the present railway club’s land there was Bahawalpur house, and adjacent to this were residents of English railway officers. But afterwards the boundaries of cantonment were squeezed to present cantonment and the remaining area was allotted to Khan Bahadur Hassan Bakhsh Gardezi. In this way the building of MGM was also taken back from Nawab of Bahawalpur and allotted to Hassan Bakhash Gardezi. The record present in military land office is present till 22 January 1943, when the record was made for the bungalows and their residents in Multan cantonment. According to this record at that time the MGM was owned by Mrs. MP. B. Aughton. Afterwards this building was transferred to Mr. MRS. A Baughton. In 1944 this building was transferred to MRS. MP Bone. On 2 November, this building was allotted to Syed Jalil Abbas Gardezi son of Khan Bahadur Hassan Bakhash Gardezi. After partition, this building was renamed as Services Club in 1947. Before this English has been using this building as a club, they had constructed a big floor of wood in the hall for dance. In 1965 this building was allotted to Armed Division. The adjacent lawn and plants had made the walls of the building wet and dampened. English had also been repairing the building time by time. But after 1970 the building got much old and clay domes were affected by the wear and tear. Till 1990 the building was in so much poor situation that it was feared that it will fell down, so it was being planned that building should be destroyed and than a modern building should be constructed on this place. But few players playing tennis in the lawn of this building from last 30 years were of the view that this heritage of Multan should be saved. The name of Engineer Tahir Bisharat Cheema is on the top among the list of these people. Tahir had started a campaign to save this building along with his friends. At least the struggle of Tahir got fruit and Commander of 1-Armoured Division Major General Muhammad Yousaf got ready to preserve the building in the present condition. Major General Yousaf convinced Lt. General Karamat Commander of 2-Core. Luckily when both officers decided that this building will be saved, after short time Lt. General Jahangir Karamat was promoted as Chief of Armed Forces. In 1996 Services Club (MGM) was reconstructed by experts of architecture in such a way that its historical shape was hundred percent restored. Extra rooms of the building were demolished. The lawns around the building were pushed far from the building and concrete pavements were built between the building and the lawns so that the water does not harm the walls of the building. In the building the modern floor of marble was constructed, the doors and windows were made of Sagwan wood. The domes which were made of clay bricks were converted into concrete domes in such a way that everyone was astonished. All the corridors of the building were opened and the pillars of Andersen style further increased the beauty of the building. In this way in 1997 building was renamed as 1997. In 1880 this building was constructed according to the climate of Multan in such a way that even in the month of june or july one does not feel hot. At the time when the building was beig reconstructed it was revealed that building does not have any deep foundation. Just hard ground was leveled up and the walls were constructed straightly over it. Although now concrete walls have been constructed around the clay walls of the building but this has been proved that their was no custom in Multan to lay deep foundations because there were not enough rains.